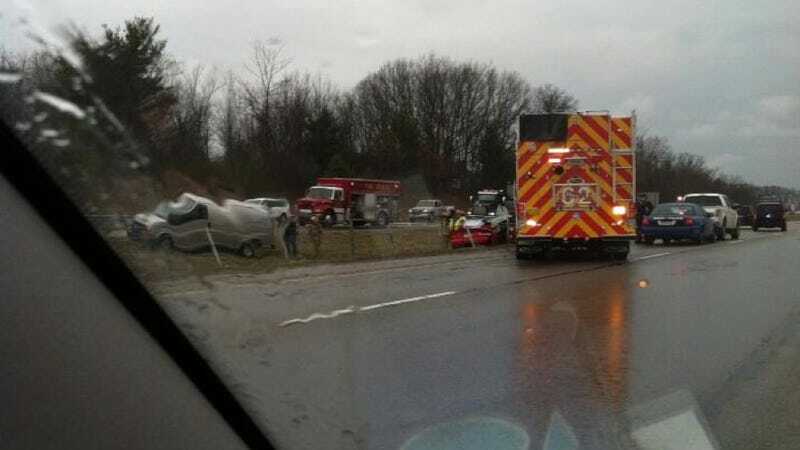 Preliminary information from Road & Track staffer Will Randolph on Twitter indicates the wreck happened on U.S. Route 23 southbound sometime after 2 p.m. today. Will said that first responders had to use the jaws of life to remove the car's roof. We don't know who was in the car, where it was headed or whether anyone was injured, but we have a call in to Chrysler. We'll update with more info as we get it. Update #1: Apologies for the confusion on the address. The crash occurred at U.S. 23 and M59, also known as Highland Road, according to a Michigan State Police official. That official said no details on the crash were immediately available, including what car was involved or whether anyone was injured. Hopefully more details are coming later. Update #2: A commenter who says he was on the scene has this report, indicating it was as serious as it looks. In light of that we're not putting out any more photos until we hear more details. Update #3: This crash was unfortunately fatal, according to radio station WHMI. They reported that a 53- or 54-year-old man from Howell was the lone occupant of the Viper. His name has not been released and it remains unknown why he was in a car with manufacturer plates. Michigan State Police told the radio station that he was traveling westbound on M59 and turned onto the ramp for U.S. 23, stopped for unknown reasons, and then accelerated onto the freeway. He reportedly lost control of the Viper and crashed into the median fence. Police say it is unclear why this happened and said "a medical cause is possible." Chrysler Group is deeply saddened by the loss of our colleague in this tragic accident and express our deepest sympathies to the Morse family. We are working with state and local authorities to investigate this incident and are unable to comment on it further at this time.